Is Kefir Safe? Could You Get Food Poisoning? Can Kefir Make You Sick? 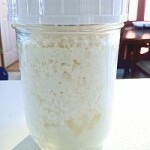 When I first started looking in to kefir production at home, there were a few things that concerned me. Firstly, I will be getting my kefir grains from a stranger over the internet. I have no idea who this person is, what their cleanliness habits are, whether they sterilize their utensils, or if they have mold in their kitchen, or even if they wash their hands. How will I know that the kefir grains are safe to use and free of disease causing bacteria and fungii? Well the truth is, you have no way of knowing unless you have a lab accessible to test the grains when they arrive. Thousands of people worldwide share kefir grains so there must be some way to determine the risk. Let's hit the internet and see what we can find on the safety of kefir. Following are excerpts with links to full documents. The article goes on to say that E Coli., Salmonella and Listeria are not suppressed by the kefir. However, researchers Garotte et al (published in The Journal of Dairy Research in year 2001) found that E Coli was inhibited for 25 hours when exposed to certain milk kefir grains. All grains produced acid products with pH between 3·5 and 4·0…. All fermented milks had inhibitory power towards Escherichia coli but AGK1 and AGK2 supernatants were able to halt the bacterial growth for at least 25 h.
Also in 2001, The Dairy Products Research Center (Ireland) studied a number of different fermented milk products including kefir and assorted cheeses, and found that kefir does inhibit listeria, E. Coli and other pathogens. A number of potential inhibitors to both Listeria and E. coli were identified (Fig. 5), in addition to Lactic Acid Bacteria capable of inhibiting B. cereus. The inhibition of Listeria by Kefir fermentates could be attributed to bacteriocin activity in a number of cases…. The study revealed the intensive multiplication of Listeria cells in milk, also during storage in a household refrigerator. The presence of bifidobacteria mixed with kefir-producing culture in dairy products was shown to essentially inhibit the growth of Listeria cells which were not detected by bacteriological techniques on day 7. Kefir has also been found to inhibit C. Difficile, Salmonella, aflatoxin (fungus frequently found in food), and other fungii. The list goes on and on… kefir has been widely studied. To be fair, there was one study that I found that showed Listeria, Salmonella and E Coli did actually survive kefir fermentation. I believe that all of the research points to kefir's ability to inhibit pathogens. Meaning that it is unlikely that you will get sick from food poisoning by consuming kefir. If you combine the research with the absolute lack of reported illness then the result speaks for itself. After all, fermentation was the only way to keep foods in storage before the advent of refrigeration. Having said that, it is still important to follow some simple steps when evaluating the safety of your kefir. Wash– hands and utensils. Sterilize equipment with boiling water. 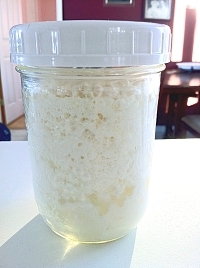 Cover fermenting kefir to keep bacteria out. Follow the recipe!! !– For water kefir especially, the ratio of sugar to water, the addition of a citrus piece… these things maintain favorable conditions for inhibiting bad bacteria and fungus. Trust your nose– If it smells bad, it is bad. Trust your eyes– Discoloration, mold on top, or anything that looks unusual should not be trusted. Would you consider raw milk kefir safe for pregnancy? If you waited at least 7 days? Hi Alison Thanks so much for your question. I live in Canada, where raw milk is not permitted except in cheese that has been aged, so I don’t really have enough experience to offer advice. Can kefir help with a zygosaccharomyces bailii yeast overgrowth? Just revealed on a stool test I had done and wondering if I need to stop kefir to address it. I can’t find much info on zygosaccharomyces bailli yeast. Hi Reen I don’t know the answer to your question. Let us know what you find out! I am curious though… are you sure you need to? Is this particular strain a problem to health?